Bathtub Transfers With Side Bar For Home Health Physical Therapy - Works for some - Impossible for Others! Why? great for some. impossible for others. Bathtub transfers with side bar? This type of tub transfer may look like a breeze but you is almost impossible for some. The concept is great. A simple horseshoe shaped bar clamps to the edge of your tub allowing you to grab onto it for stability while stepping in and out of the bathtub. The build of this bar is usually very safe as long as it is installed correctly (and installation requires not much more than tightening a couple clamps to the side of the tub). Once secured, the bar is not likely to move. It is important to remember that transfer aid devices such as these are not designed to keep your from falling or even break you fall. These are designed to assist you with balance while transferring in and out. Doing bathtub transfers with side bar can make or break a safe and effective transfer... proceed with caution. 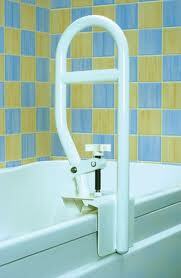 This type of bathtub transfer bar comes in various shapes, material strength and colors. Four options are shown below. I've never seen this transfer bar in person but it does provide two height levels of assistance. It appears to clamp onto the tub with a sort of "lock down" mechanism. This particular model seems to be made of durable plastic. You will want to keep that in mind when considering your needs. Some transfers bars will have a weight limit written on them or the box they came in. I have worked quite a bit with option 2 and like it very much. This transfer bar is usually made of some metal (usually steel) but I'm sure there are some made of durable plastic. This bar is secured to the bathtub wall by tightening a clamp down knob (sometimes two). It is very sturdy and has been the number one choice in my years of home care since 1995. This transfer bar option is steel, has a roughed up handling point on the bar for ease of grip and is very sturdy. However, as you can see, you lose height for more stability. This can become a huge disadvantage as you will see below. It is obviously longer than it is tall and takes up more bathtub wall space. It is secured with two knobs that clamp it to the bathtub wall. I don't know if this tub transfer side bar is made anymore. This durable plastic option has worked out satisfactorily in my experience. It is plastic, but designed well. This pictures shows it a bit shorter than it actually is. It lends well to the objective of providing support for transfers in and out of the tub. A Walk in bathtub eliminates the need for bathtub transfers with side bar, are a wise investment and can increase the resale value of your home for those looking for aging in place accessories in their next home. what you need to be safe. Since bathtub transfers with a side bar are relatively inexpensive, do yourself and your loved ones a huge favor by purchasing one to assist you in and out of the tub. Your confidence level may go up as well as your desire to bath and thus benefit from this form of hydrotherapy. If you can afford a walk in bathtub, these seem to offer the most security and the highest level of enjoyment out of bathing while doubling into a hot tub for even more hydrotherapy benefits. Ultimately, bathtub transfers with a side bar will require a certain level of strength, a certain amount of range of motion or flexibility and a degree of balance depending on the configuration of your bathtub or shower. As we age and tend to lose some of these "spring chicken" attributes, our risk of falls, esepecially in the bathroom tend to cree up. One fall can change lives forever - don't let it be yours or your loved ones! Strengthen Your Legs For Bathtub Transfer With Side Bar Easy!! Inflatable Tub for Bedbound Patients! Walk in Tub With 12 Jet Warm Air Massage!